TODAY IS THE LAST DAY TO SUBMIT YOUR MATCHED COVER!! Do you want to win your own SIGNED and PERSONALIZED ARC of Matched by Ally Condie? You have exactly 12 hours to get your cover in! Why I want it: This sounds like a new and unique take on the inter-species relationship genre, since the MAIN character is actually the “alien” species. However, the idea of a good/evil love triangle makes me a little nervous. I tried to get this from NetGalley and was denied several times. *sigh* Guess that's a sign that I'm not meant for ebooks, which is FINE with me. Luckily, I got on the tour for it at Around the World Tours! Yay! 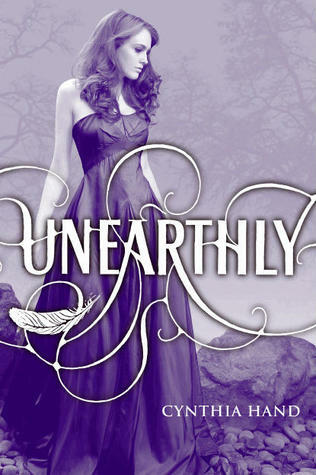 Do you want to read Unearthly? I read it through Netgalley and it is amazing! I might pick it up...but I haven't liked any teen fallen angel book I've read and I'm getting tired of the love triangle. Isn't one guy enough? I'll wait to see your review before I make a solid commitment to try again on the angel thing. I'm a bit uneasy as well. I don't like dark angels, it's not right and I don't like demonica. Oh, well, I'm starting it tonight!